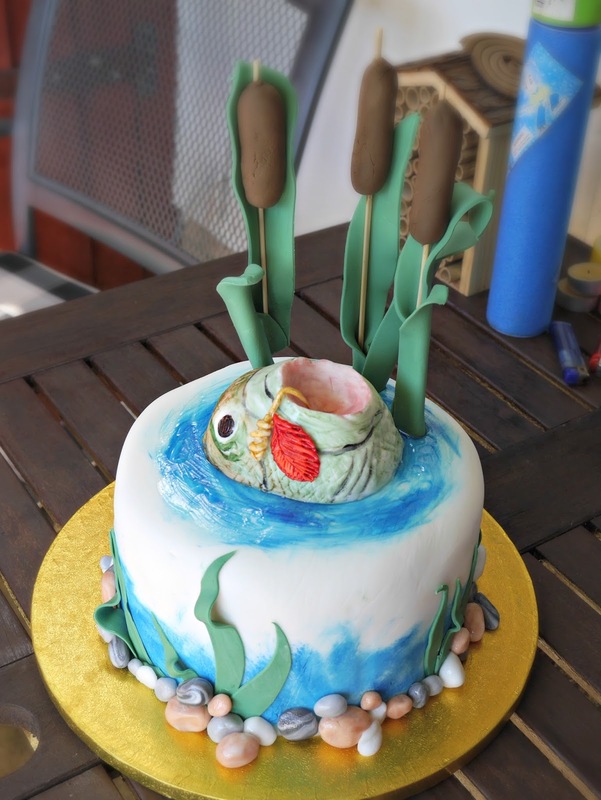 I made Bob--I have no idea why I named a fish--for my father-in-law's combined birthday and retirement in July. After years of hard graft he's looking forward to spending his days fishing, so I thought I'd start him off with an easy catch! This is a bit of a make-ahead cake. The bulrushes need to be made a few days ahead so that they can dry out and (fingers crossed) stick to the skewers. 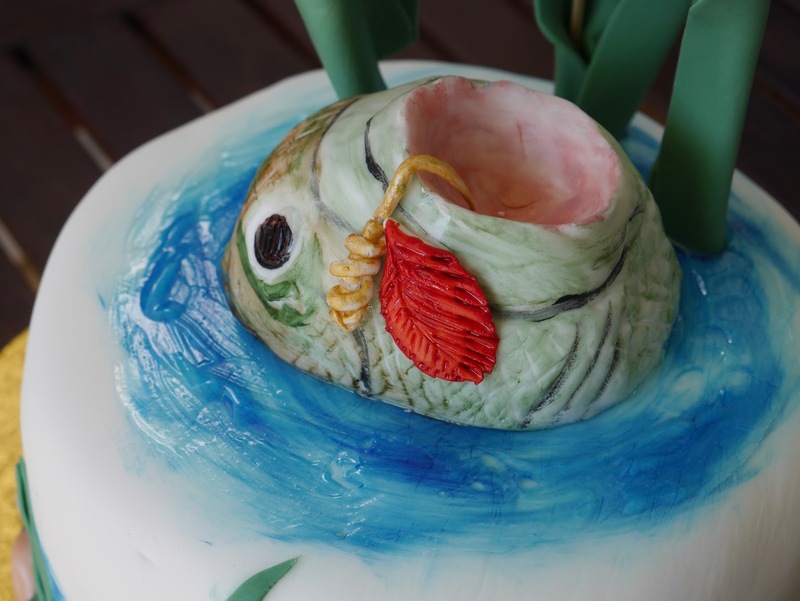 You can also make the fish head in advance, too. I'm afraid that I didn't take many pictures of the cake process--sticky hands and cameras aren't a good combination--but for the rushes I mixed 50:50 flower paste and fondant and coloured about half dark brown and the rest holly green. Getting the fondant to stick to the skewers for the bulrushes was a bit of a mission: I tried dampening the skewers by soaking them, brushing with sugar glue, and (of all things) some jam. I wedged the skewers into a polystyrene box insert that was lying around so that they could dry without resting on a flat surface and then draped the leaves over the rest of the skewers to give them the right shape. 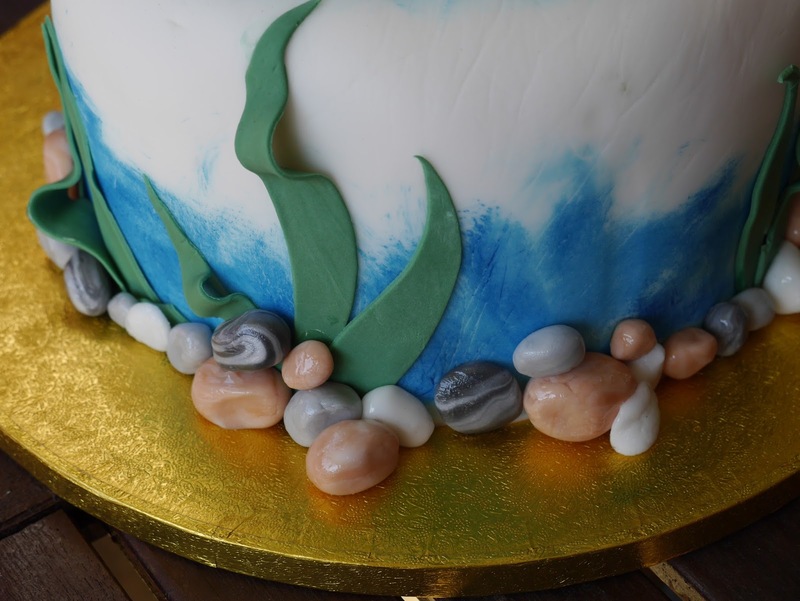 Once dried out the bulrush heads stayed in place (thank God) and the extra leaves I made were easy to stick straight into the cake for a nice pond scene. For the cake itself I turned to my new favourite recipe: Lindy Smith's Madeira cake. It makes a fabulously deep cake with a lovely flat top, so there's hardly any waste. It's really tasty, too, which is the main thing! It's easily split into three layers and looks really impressive when cut. Bob went down a storm with my father-in-law. He couldn't bear to cut into Bob so, like a real fish, he's been stashed away in the freezer. We did eat the rest of the cake, though!! Thanks, Jenny! Maybe one day, especially if I can somehow combine cakes with crafts in a shop! Angela, this is brilliant!! How long does it take you? I made an Angry Birds cake for my brothers birthday and it took aaaages! And I was pretty high on all the birds I eaten that were slightly misshapen haha. Anyway, you need to open a craft and cake shop. If you're looking for a partner! Ha.